Author(s): Jennifer M. Redington, Leonid Breydo, Hussein A. Almehdar, Elrashdy M. Redwan, Vladimir N. Uversky. Department of Molecular Medicine, Morsani College of Medicine, University of South Florida, 12901 Bruce B. Downs blvd., MDC07, Tampa, Florida 33612, USA. Keywords: α-lactalbumin, CD, fluorescence, guanidine hydrochloride-mediated unfolding, aggregation, intrinsically disordered protein. Affiliation:Department of Molecular Medicine, Morsani College of Medicine, University of South Florida, 12901 Bruce B. Downs blvd., MDC07, Tampa, Florida 33612, USA. Keywords:α-lactalbumin, CD, fluorescence, guanidine hydrochloride-mediated unfolding, aggregation, intrinsically disordered protein. Abstract:Since camel milk has been attributed with various medicinal properties not found in bovine milk, we are systematically examining the differences between different proteins in bovine and camel milk. The purpose of this study is to investigate the structural differences between the bovine and camel α- lactalbumins. α-Lactalbumin is a highly abundant protein present in the milk of all mammalian species. 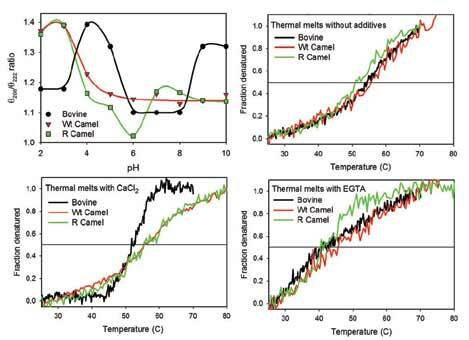 Here we found several structural differences between bovine and camel α-lactalbumins: camel protein is more stable towards thermal and pHmediated denaturation but less stable towards guanidine hydrochloride-mediated unfolding, aggregates faster and is predicted to be more disordered than bovine α- lactalbumin.